At CTS RV Repair, our number one focus is ensuring your RV or trailer is in the best shape possible. With 30 years of experience, our honest, reliable professionals offer comprehensive repairs, parts, and even storage for boats and RVs at our facility! If your RV isn’t functioning in tip-top shape, costly repairs and setbacks aren’t far behind. It’s important for the function of your vehicle and your safety on the road that you immediately seek RV repair in Salinas, CA when you suspect a problem with your vehicle. Pinpointing and resolving problems with your brakes, appliances, roofs, wheels and other critical systems means saving yourself the headache of seeking emergency repairs and knowing at all times that you’re safe on the road. At CTS RV Repair, we know the importance of proper repairs and service, which is why we go above and beyond to provide it to every RV that we serve. 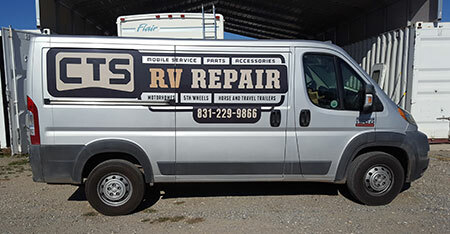 As your premier provider of mobile RV repair in Salinas, CA, CTS RV Repair is here to look after our local RV community. Unlike general automotive shops, we’re not here to turn a quick buck—our repairs are provided because we care about the safety of every driver and the longevity of your RV. We stand by our work and take pride in providing honest recommendations and superior customer service. When you choose us for RV service, you’ll never have to wonder if you’re getting what you deserve: you can always be certain we’re going above and beyond for you. We hold a C47 Mobile Home Contracting License. We can perform any and all RV repairs, with the exception of engine service. We can locate and retrieve virtually any part you might need quickly! Our trailer storage offers 24-hour accessibility and security. We’ve got more than three decades of professional experience! If your RV is experiencing troubles and isn’t functioning up to the standard you need it to, get in touch with us to set things right again. We’ve got parts on hand and the expertise to fix your RV!